The write up appeared in KANNADA PRABHA daily on 30-01-2011. 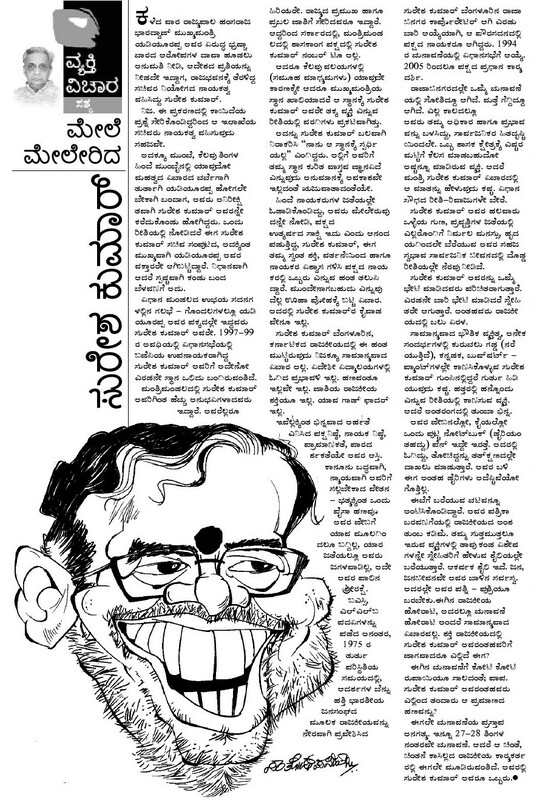 This article is written by well known writer Sri Sathyanarayana. Let the enjoyment of reading be yours. Sir, Its been some time that I have been following you blog. I need an answer for my question pls..be it your personnel opinion or whatever.. When the president of a well known , better party says "CM of a state is legally correct but morally wrong". Is it acceptable to continue with same CM ?how many more chances ?One should understand the importance of party not the individual. I am not an astrologer but being a young CITIZEN of this country, my prediction is that handing over the power to a right candidate inside the party would enhance image of this party. I tried to communicate the same to the CM through his website http://yeddyurappa.in but no use. I feel the website is meant for just one way communication. Hope to get some answer from you on this..